The short stroll from Key West‘s Duval Street to Nancy Forrester’s house takes visitors away from the touristy main drag and into a much more residential part of town. Scenery changes from shop-window displays of neon muscle shirts to chickens strutting along the sidewalks in front of small, well-loved homes. In the backyard of one such residence is Nancy Forrester’s Secret Garden. Before she turned her current property into a sanctuary for big birds, Nancy Forrester and her parrots lived on the last undeveloped acre of land in Key West. For more than 40 years, she maintained the land and its meditative gardens, its paths that meandered among palm trees and orchids, and its artist’s cottage and gallery. But in 2012, finances and property taxes forced Forrester to sell the land and move her operation into the home next door, which is where you can find her today. The new Secret Garden still feels like a lost world. The property at 518 Elizabeth Street, tucked away behind majestic palm trees, is overgrown with greenery. You’ll open a creaking fence door and feel as if you’re walking through the wardrobe into a magical hideaway. Your steps as you walk around to the back of the house might be the only human sounds in this hushed sanctuary, with its centuries-old trees that crisscross overhead and block out street noises. In the backyard, Forrester houses parrots, macaws, and cockatoos in enormous cages. The colorful birds chitchat with visitors, and some are gentle enough to climb on arms. All of the birds are rescues—from all around the country—that have been given a new life in Key West. Read the cages’ informative plaques, which tell the stories of the birds and how they made their way into Forrester’s care. Better yet, ask Forrester, who can usually be found holding court in one of the plastic lawn chairs, with at least one macaw or cockatoo on her arm. She will happily spend hours talking to visitors about her passionate mission to rescue these birds from abusive situations, her love for them evident in everything she says and does. Visiting this peaceful spot, beneath a blanket of ferns, banana palms, and orchids, is like finding a bit of untouched magic in Key West. Admission to Nancy Forrester’s Secret Garden is $10 per adult ($5 per child). Forrester gives a “Parrot 101” presentation at 10:00 a.m. daily. Have a question for Julianne about her trip to Key West? Planning a trip yourself and need advice? 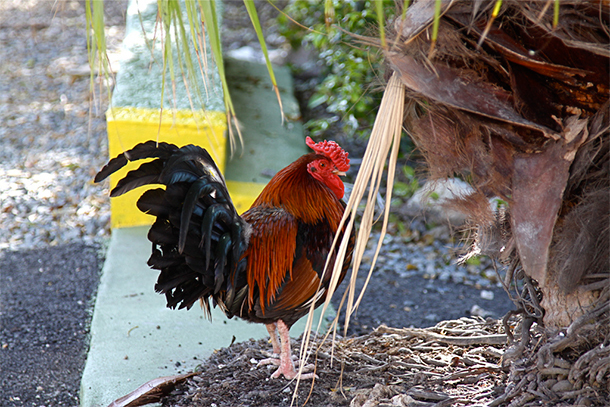 Want to share your own Key West experience? Leave a comment below! You can also follow Julianne on Google+.